This entry was posted in Online Retreat by Joan. Bookmark the permalink. So glad you offered this – I have started to “sponsor myself” as you suggested not too long ago… it feels good – feels right… baby steps… but I’m taking them…. am so glad to be able to be in touch with you…i NEED some peace, and the affirmation that being ALONE is good! am so very lucky to be living by lake michigan so can be on the beach nearly every day — it is my PEACE and my joy. i am blessed, but need a spurt of energy! so glad you’ve gone online! I met you several times, some years past when I attended your retreat by the sea in Cape Cod. It did change my life and I did realize the importance of retreat from that time on. I now am facing some struggles and hardships in my life. Financially I am pretty much wiped out, I am hoping that filing for bankruptcy will at least save my house and car. But so much more than that, I seem to have lost my way. Being a healer myself, I find that I have lost that connection with healing myself first and foremost. I have neglected my body and spirit. I know I need to get back to that, but the phone will not stop ringing. I cannot seem to put it all aside right now as I need to get my life back on track. I am hoping that when I get this financial mess behind me, I can find the real me once again. Thanks for doing this online retreat, it’s all I have right now. Thanks so much….. all of us need to read your words of wisdom. From the words you share we can all reach for the stars and become all we were created to be! God bless you now and in the future as you remind us about self care. With out caring for self we become stale and used up. Joan, You are wonderful!! I echo many thoughts of the women on this special retreat. Women are special–we just have a hard time finding it. Thank you, Joan, for this gift of time. The retreat is happening just when life seems to be a progression of transitions and the temptation to pass through it without reflection or direction is so great. Joan, I love this idea of an online retreat. I too, have read all of your books at least once and “A Year by the Sea” twice since I heard your presentation at the American Association of Orthodontists meeting in Boston two years ago. We are recently retired and have moved to California to be closer to our children and their spouses. I miss my close friends and the spiritual sharing time together. I look forward to the insight and sharing that you and my fellow retreat participants will offer in the weeks to come. Thank you for this opportunity. Blessings! I have read all of your books and have recommended them to many of my therapy patients. I look forward to being a part of this circle of women as we join in retreat. Thank you for providing this sacred space. Joan, thank you for this novel idea. I have immersed myself in your books and words. they resonate with my soul. I’m writing from Maui. I know, it’s rough, but it is a combined business/vacation trip. Just finished Second Journey and I’m afraid the book is entirely yellow with highlighted sections. Last January, I was also here..that time alone, without my husband, who had other more important things to do. I decided the tickets were paid for, so why not? Off I went on my own retreat. Seven days with no schedules, no opinions, no cares. I slept and read for the first 3 days, then I wrote, walked, and randomly met a few very interesting people. I even found a labyrinth on Maui. When I got home, my friends were surprised to find that I’d traveled alone. Why not! It was bliss, and I highly recommend it. I’m ready to go again. How does Prince Edward Island sound? I’m going to reread Anne of Green Gables. Iona?? That’s on the list too. Thank you for your gift of wisdom and constant inspiration! I love that you are doing this! I still pull out notes from our Feb.Cape Cod retreat and continue to review all your books to get my fix of “Joanisms”. What a journey this has been. I have finally made some very difficult but needed changes in my life to nourish my soul and be true to myself. Each day my spirit awakens more and more. Each day I feel more empowered and I look forward to what the future will bring. I will be here on Mon and Fri to get my “Joanisms”. God bless you and all that you do. Big Hugs Joan!! Thank you, Joan, for leading this online retreat. We all need the reminder and encouragement for “retreat” and setting aside time for ourselves. This online “circle” can provide support, wisdom, strength and encouragement for one another. Oh…the great memories of Iona! Am so grateful I can learn and embrace your journey at Iona this fall though your sharing your insights with us in this blog. Am still so sad my health did not allow me to go this year. Hopefully next year. Thank you for sharing your heartfelt wisdom to your fellow women travelers on this journey we all are on. Eliza we shall meet on the shores of Iona and it will eventually bet he right time for you! What a wonderful opportunity to be able to share my thoughts and feelings in a trusting and safe place. I am looking forward to the experience. I am seventy years old. I have spent the last five years rediscovering and resurrecting my locked away soul after many years of living in an abusive relationship. I am at peace with who I am and I am still a work in progress. Thank you for this online retreat! how many of us must, for a time, lock away our souls. But as you know a soul cannot be squelched and when it emerges ready to soar,watch out.May this experience help you to continue to blossom. Thanks go out to you all who have shared your thoughts, I find them most encouraging & inspiring. I hope to make it to a retreat in person one day. Just felt the need to respond to your reply Kim as I felt your words as if they were my own. I too have felt “beaten”, always the caretaker of all around me, having to solve all the problems and issues at the expense of my own self which is probably why at 46 I am finding the need to start a journey in finding that girl that existed so long ago and got lost in everyday life. She is still there and has been trying to be heard. It is comforting to know that there are so many of us that are feeling the same things and thanks to Joan are able to come together and take this journey. I too hope to one day attend a retreat, for now this wonderful online retreat will be a great starting step. Kim and Vicki – me too! Right smack dab in the middle of it – the feelings are overwhelming and somewhat consuming. Having fellow travelers is encouraging. Hi Nova Scotia, ie New Scotland friend. How perfect that you are joining us. Ilove your country, by the way. Go joan. What a great idea.Thanks for inspiring us all to take a step out of over doing it and towards more moments of tranquility. The most simple adjustments in life make differences. I have choosen to step out of many things and feel all the better for it. As with decorations so with life -often less is more. knowing what is outlived is a good thing so you can make room for what is unlivedbut we all need to pause between activities and life’s occurences just to honor who we are and what we have made possible forourselves and others. Thank you so much for sharing in this way. I always want to come to your retreats, but it is so hard to get away. It’s even harder than before, since my husband had his stroke in February. I have little to no time alone and have to fight for every few minutes I can grab. My best time is when I “have” to walk the dog. We go on some pretty long walks!! Just returned from Corpus Christi, TX where I had a chance to walk on the beach and it reminded me so much of my winter walk at Chatham in 2009. I loved that! Can’t wait to hear more about Iona. My fellow “Ladyslippers” are getting together this weekend. I’m so proud of all of them. idea. Thank you so much! Joan–I too, am grateful for this time to retreat. I’m at the crossroads again as the relationship with my husband once again falls apart (another crisis for him –worse now though than 7 years ago that brought me to Chatham). Not one to give up, I still hope and pray he is able to “find” himself and see me as his best friend, soulmate and lover …… but I also know that more than ever I must look within, draw on my strength and move forward. For my own survival and for my sons. These past two years I’ve taken up backpacking with my scouting unit and absolutely love feeling my body work and get physically stronger. I love the rhythm of the steps and the filtering of life’s stresses as I pass through the woods. I also love the simple life on the trail–walk, find water, set up camp, cook, clean up, sleep, cook, clean up, wake with the sun and do it again all over again. After a few hours of hard hiking, I find this incredible stillness and peace within and clarity of thought……..What I’ve been missing is the voices of my fellow retreaters…how I learned so much from you and all of them in Chatham. My girlfriends who know of my current troubles are incredibly supportive and I love them all. I’m looking forward to your mentoring on this retreat and to everyone’s contribution. Thank you! JOAN, those words are terrific, just what I needed to read…I am on this journey with you and all outstanding women who are on a constant emerging of self….. Your journey struck a chord within me. I was where you are fifteen years ago. No matter your personal outcome, I applaud and celebrate your courage to find yourself, to rejoice in who you are, to connect with others, and to say yes to an activity that melds you with nature and fellow sojourners. When I made similar decisions when my marriage was stressed for the upteenth time, my husband said I was selfish. I knew otherwise. I was feeling alive, joyous, and connecting with parts of me that had been dormant. That wasn’t being selfish. That’s what we’re all meant to find and share. It was exhilarating. Erik Fromm (another gifted ‘Erik’) once said that the greatest example of what love, joy and happiness is for children is to have a mother (parent) who loves herself. That’s the gift you’re giving to your sons, that wonderful example of joy, courage and connection. So I wish you peace and fulfillment on your journey. Thank you Joan, for sharing your trip and retreat. I have read all of your books, watched you speak and dream of attending one of your retreats someday. 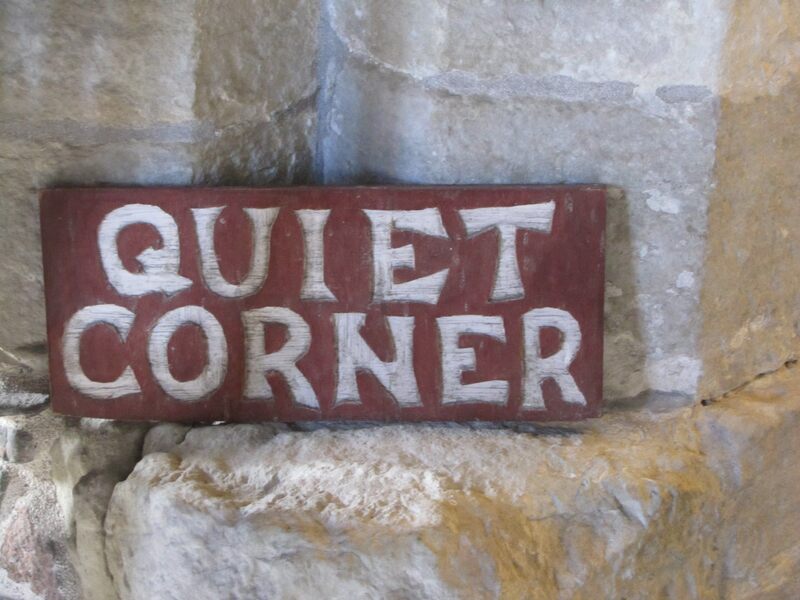 I so look forward to taking time for myself finding my quiet place, to hear inside, opening my mind, heart and soul. A renewal. Being apart of this retreat is powerful. Today I feel as I have gained a new friend, you. Thank you my friend Joan. And I have a new friend in you==we can all use a little bit of the others energy…unfinished women spreading the word. 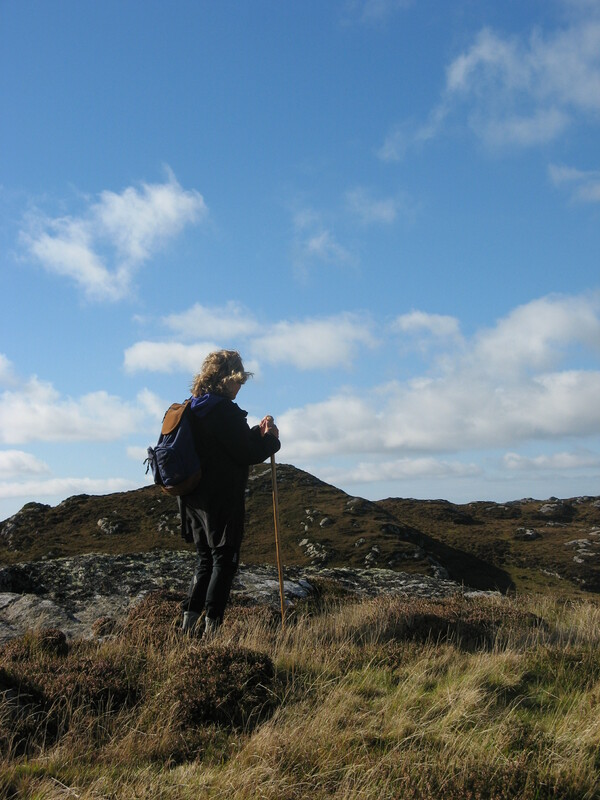 With my Iona greenstone in my pocket I set off for a quiet walk late this afternoon. The silence, the physical activity, the brief respite from meeting the needs of others and concentrating on myself were a perfect beginning to the online retreat. remember when I put that tartan scarf around you neck knowing that it would always bring you back to the spiritual strengths of Iona? Now that it is chilly seems we should all get out such protection and such a gift. From the serendipitous time I met you at Changing Hands bookstore to today, your words have given me strength. Thank you for being, and thanks for this Goddess circle. We need a reminder of who we are and what we are capable of! and indeed, we are as unfinished as the shoreline along the beach, meant to transcend ourselves again and again! I just started reading and working on Marianne Williamson’s book: A Course in Weight Loss. I think that for me, putting the two together are perfect. I can do the exercises from the book during my time each day! :>) Thank you, Joan. Thanks Joan for all your thoughts. I love a retreat and giving myself permission to just be in my thoughts. I am ready to re-read your books and journal. My goal is to go to one of your retreats. Today is November 9th 2010 and we are never going to get this day back again. So hurray for you…making sure you have that precious time to know YOU…there is no one more important. This is what I have been waiting for since I read your first book!! My life’s goal is to some day be able to attend one of your “real” retreats! Until then I am thrilled that I can attend one online and join with a new “circle of friends”! I can’t wait! Thank you for writing what many of us feel and are thinking. It was as if your words came from thoughts in my head that I was too afraid to say out loud. Been going on this journey and having the world bring to me the tools needed like your books, friends who seem to be going through the same journey and now this retreat. Finding a quiet place is very difficult but one that I will find, have some ideas and will be thinking while working all night. The little voice of my spirit has been getting louder and is very excited that I am finally listening. Thank you for the stepping stones. thank you for persevering. As I say in A Year by the Sea, The habit of deference can grow like a cancer on the soul of a woman until what she becomes is out of her hands. So glad no one is deferring and so many are embracing at the very least this online retreat! I’ve been looking for your next book and understand with all the trials you’ve been through lately that it’s the last thing you’re thinking about. However, this blog is such a great outlet for you and such a gift to us all. Thank you for taking the time and I look forward to joining the “sisterhood”. Joan…unbeknownst to me, it started when I saw the Abbey from the ferry and it has not stopped. One thing that I have learned from my journey is that changes are ongoing; when they arrive they make their own statement in very unexpected ways. Tonight we are expecting our first snow and the moment is at hand to retreat within….your online retreat is perfect timing, not only generous but reviving-I thank you. it will be fun as we go along if you “get Iona into you” again…likr it was when you saw it from the ferry…still is magical to me. 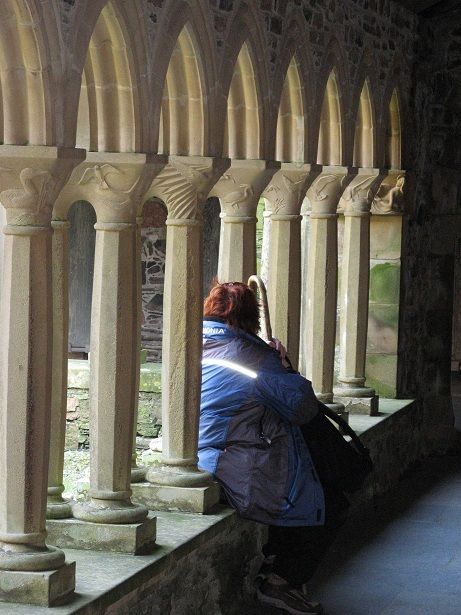 Joan…even though it was a year ago that I was in Iona, the impact of it all was not instant. Did I expect that- I don’t know. But what I have come to know is that each footstep that I took there has had some meaning that I didn’t even know about at that time. It began to happen months later. A wayfarer I met on the road to the Abbey told me…”there is magic here on Iona.” This happened right after I arrived there. Only now, I have begun to understand her words. I’m so glad you are doing this. It’s like having a personal coach or friend. I walk every day and get away for about an hour, but I like the idea of adding to it coffee with a friend or buying flowers. This online retreat gives me a sense of sisterhood and a feeling of encouragement. Looking forward to the next weeks. This is a good time of year to have this for focus and perspective. That cloister . . . I love that you are doing this, Joan. So perfect as we move fully into Samhain. The quiet place for me lately seems to be on the train or on the daily walk across the Loop – outside, but in the cityscape. I am new to Joan Anderson’s work and blog but love it. With regard to retreats and silence, I have found I learn nothing when I’m doing all the talking, so it certainly is medicinal to listen to everything, even the silences around us. Hi Joan, what a great idea…online retreats! I first learned of the importance of the importance of retreats from your books many years ago. It had such an impact that I continue my little retreat rituals and it never ceases to amaze me what new ideas pop into my head or what problems solve themselves during these quiet times. Thank you so much for your words and looking forward to the coming weeks! and as those words pop up–look for the ones that come again and again and make them your intention for the Solstice and the New Yeaar! What a perfect time of year to have a personal retreat — I am not able to “go” anywhere, but something local will do just fine. I am challenged to find my special spot and seek it out each day in the weeks ahead . . . for refreshment and renewal. I find my peace in God’s Word and will bring it along for meditation. Thanks for your encouragement, Joan. We have not met, but I feel I know you through your writing and my friend, Cathy. anywhere is everywhere if you are there…I find it on my beach each day as I offer thanksgiving, praise, and then petition. We all have heavy hearts…some more than others…and being women we are so compassionate. But we MUST nurture ourselves…each day if we only spend a few minutes honoring all that we are and do how much better will we be and those around us. Thank you Joan. I am happy to have a chance to connect. Your weekly writing helps me to remember to stay focused and to move forward,make myself happy! I will continue to reflect-plan-find adventures. You are inspiring me !!! No one insists we have moments of joy–we need to grab them for ourselves. You go girl! Joy is a duty! Thank you for the encouragement to embrace the gifts of this season and to find the sacred in the midst of our everyday life. This “virtual circle” is such a lovely way to nurture the tender fires of our own personal work and hearten all of us on our journeys… thank you for that gift as well. as Jean Shinoda Bolen writes: When there are a million circles of women worldwide the culture will shift from the patriarchy to the matriarchy. I am going to be candid and say that I am in the most challenging and painful time of my life . While my once incredible husband spirals into midlife crisis, infidelity with my long-time “friend,” and detachment, my heart, family, and relationship of several decades are ripping at the seams. I am working very hard to remember and live all that I have learned from your words, Joan, and from others who have inspired me over the years. This retreat is a gift to me as is the sense of sisterhood. We are all living our own stories and challenges. May each of us find the spiritual lessons in them and discover we are better, stronger, wiser, and–yes–even more joyful and fulfilled at the end of these times that call us to reach more deeply into ourselves than ever before. We will find treasures there if we hang on. Over the years I’ve read your books and I have related so much to what you’ve experienced, felt and thought about. I’ve longed to attend one of your retreats but due to family committments and finances it isn’t a possibility for me. So when you offered an on-line retreat, it really is a gift to me Joan. The timing couldn’t have been better. New and challenging chapters in my life have begun and knowing I can go on-line and receive encouraging, thought provoking words from you will definitely be a great help to me. Thank you Joan, for your being true to yourself and expressing it, has been a help to more women then you’ll ever know. So happy to be able to spend time with you online…..I’ve been reading and re reading your books as they are what I need. Looking forward to Monday and Fridays and spending some of those days with you. Joan, I am so grateful for this inspired and generous idea. It is truly a gift. Thank you! I am honored to join the circle—with everyone and yet alone. Hi Lisa What fun to walk with you I’ve missed you! I am looking forward to this journey with everyone. As a multi-tasker from 2nd grade (the one teacher comment on a report card from 2nd grade that has always stuck with me “Roxanne uses her time very wisely”), I have never successfully been able to master the art of “retreat” for myself. Thank you for sharing with us all here! we will take specific steps each week…not too much..llittle steps as we trek toward a new kind of centeredness and wholeness. Glad to have you on the path. Thank you for this. I have enjoyed your books and until I can attend one of your retreats in person, this is a welcome experience. Katie…share with me the grief. So many women I know are at the crossroads…needing to shed, release and then receive. Hang in there during this online time as we work together for solace. Thank you so much for this. I will be forever faithful to your writings. You write as if speaking just to the reader, a friend. I love having you as a new friend Bette. Thank you so much for taking your time to do this for all the “wanderers” out there. Already feeling the stress of the holidays, and life in general. This will be a wonderful balm for my life right now. I was thrilled to see this “Online Retreat” offered. Following Kripalu this summer with you, I have needed additional work toward my new self direction. Ritual and patterns are particularly restorative for me. This online retreat feels so good (as others agree!) and perfect for this changing of seasons. Thank you again for your continued work for others and in so many diverse ways. It is the time of year that the Celtic people went INSIDE to contemplate how they should become new…this retreat is timed so that we can begin to develop new directions and insghts that can be planted this winter to emerge in the Spring. Setting “soul deadlines” is one way to stay the course. Today’s economic times have made it very hard for my family, let alone me by myself, to participate in any travel of any kind. The past two years have been awful. The online retreat is the perfect answer to my need to get away and re-evaluate. Sharing is what women do…it used to be the quilting bee…but whatever the form, if we can talk together online and feel strength, not isolation, we will be building a new kind of circle. Joan…this feels good. Thank you for doing this; I will be following it closely as I am in the midst of holidays, moving and working. I need this more now than ever before as I am beginning to find my voice. and how important each of our individual voices are! Imagine if we had a platform and could speak collectively–those of us who possess such great insight. As I’ve grappled with existential, paradoxical stirrings in my soul & body – especially since ‘retiring’ from the workaday world a year ago – I’m reminded that ‘retreat’ and ‘retirement’ use the same word in French. Living deeply & wholly within my soul’s active silence is the paradox, the trick, the key. Hopefully this online endeavor will help us all strengthen the soul–for if we can hear what it wants to tell us, we and those around us will be the better for it. Thank you for this gift of silence, of being with myself, of reconnecting and re-evaluating my destiny. I so look forward to sharing this journey with you and our fellow retreaters…. SO glad to be able to wake up and read! Thank you for sharing.